Health Commissioner Sherlita Amler, MD, urged residents to check their own vaccination status and protect themselves and their unvaccinated children from measles by getting the MMR vaccine from their provider or a special county clinic. To reserve a spot at the Tuesday, April 16, 10 a.m. to 6 p.m., 25 Moore Ave., Mount Kisco health department MMR clinics, go to http://www.health.ny.gov/gotoclinic/60 . Amler advised parents to consult with their healthcare provider about moving up plans to give their young children the MMR vaccine, which protects against measles, mumps and rubella. 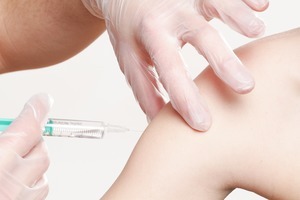 The County Health Department arranged these special clinics, after publicly urging timely MMR vaccination, after eight unvaccinated children in northern Westchester were diagnosed with measles. The children do not attend public schools or daycare programs. Measles is a highly contagious virus that causes fever, rash, cough, runny nose and red, watery eyes. Tiny white spots may appear in the mouth and a rash may appear on the body two to four days after symptoms begin. Complications can include hearing loss, pneumonia, swelling of the brain and death. Measles is so contagious that when exposed, nine of 10 people who are not immune will also become sick from the virus. Without knowing they are sick, an infected person can spread measles to others up to four days before the rash appears, and for up to four days afterwards. Dr. Amler cautioned anyone who thinks they have measles to call their doctor and report their symptoms. They should not go to a health care facility unannounced to avoid spreading measles to others.